Fat Bear Week — a fleeting celebration of enormous, perfect brown bears — has sadly come to an end. The battle started last week with 12 beefy boys and girls in Alaska’s Katmai National Park, and culminated today in a Facebook showdown between the two finalists, bear 747 and 409 Beadnose. Though all the bears have put in admirable effort and showmanship, while having absolutely no idea that this contest is happening, there can only be one America’s Next Fattest Bear. And the winner is: 409 Beadnose. “The whole point of it is to really educate the public — this is a struggle for survival for these bears,” he added. “They’re going to lose one third of their body weight in hibernation and so that’s why they’re eating as much as they are, just cause they have to gain all that weight back that they’re going to lose in the winter.” The bears’s competition training diet primarily consisted of salmon, and the largest of the chunky beauties reach 1,000 pounds. For those reeling at the conclusion of Fat Bear Week, take comfort in the fact that Katmai’s live bear cam will still be running for the next few weeks. 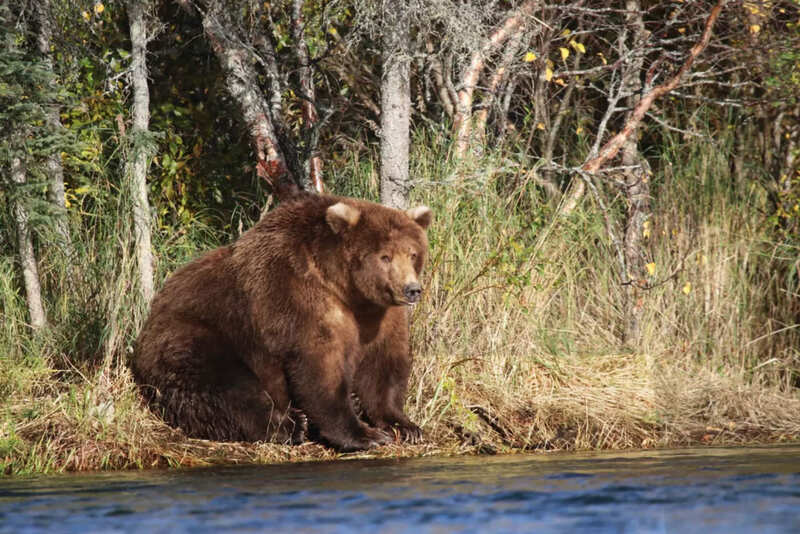 Until next year, may your hibernation dreams be sweet and your bears … extremely fat. Here’s a Park tweet showing an earlier stage of the competition, just before Beadnose edged out 747. The competition is apparently decided by readers’ “likes” on Facebook, not by weighing these beasts. In the meantime, here is the winner: the magnificent 409 Beadnose. No bear fat shaming, please: she needs that weight to hibernate! NPR also has a story on the contest, including pictures of the two final contenders before and after. Look at that weight gain! These are truly Sumo Bears. I don’t know: this was a very close contest. Look at the salmon belly on 747! 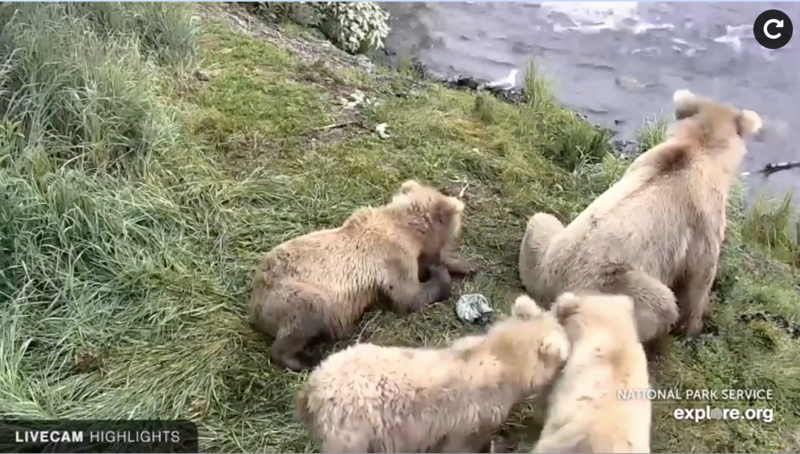 You’ll want to click on the “live bear cam” link above: a few minutes ago there was a mother and three cubs scanning the stream for fish. I took a screenshot (below). Some day I will be up there and watch the grizzlies heave big salmon out of the rapids. This entry was written by whyevolutionistrue and posted on October 10, 2018 at 2:00 pm and filed under animal behavior, animal cams, contest, mammals. Bookmark the permalink. Follow any comments here with the RSS feed for this post. Both comments and trackbacks are currently closed. This is the kind of fat acceptance I can get behind. Getting to Brooks Camp is on my bucket list. It is about $2,000 per person for airfare from Anchorage and 3 nights in the lodge with meals extra. A cheaper bear watching option is Hyder, Alaska. You can actually drive across British Columbia to get to Hyder. Went there several years ago. Only three bears were hanging out, but it was still worth the effort. … the magnificent 409 Beadnose. AAAAARRRGH. I’ve always wondered what coffee would feel like coursing through my nasal passages. Not so good, actually. Oh, and you owe me a new keyboard. Great story on bears, but also on the stock market today. Down more than 800 points. Oops. Wrong link. Can’t delete it. Bears are delightful creatures. Lovely pics! And he can still outrun me. She…and she can out swim you and out climb you. Basically if she or her relatives really wanted to get you, you’d better be well armed or indoors behind stout doors. Ah, I didn’t actually read the article. Even if you’re well armed, you better get a head shot, or you’re toast. Or should I say dead meat? No. Aim for the large heart/lung region [between the forelegs if bear approaching directly] – the head is tough, thick bone & the encased brain is a small fraction of the head volume. Well, I don’t know anything about bears, and I’m certainly not going to be in a situation where I might end up needing to defend myself from one. Because I don’t know anything about bears. And I hate camping. I like hiking, but I don’t carry a rifle and I’m not in grizzly country and I don’t hike for more than a few hours on common trails. I was nearly bit by a rattlesnake once. That’s about as exciting as my nature stories get. The last I heard was you wave both arms in the air and scream at the bear. I am used to seeing skinny bears in the North Carolina mountains. These are monsters. First thing* off of the pontoon plane in from King Salmon and onto the shoreline just off of Brooks Lodge which I had had to do (July y1997) is attend Bear – Watching School. Mandatory. Grizzlies, all of them, preclude — always — anywhere and everywhere including humans’ suppertime venue back at the ranch, the passages and the pilgrimages of humans: IF one or more Ursus arctos is between you and your noms, then you, Human, you wait. Including TO the point that you may altogether miss out upon the last served – up meal of the Lodge’s day ! Darling sight for one’s eyeballs’ gaze this whole deal certainly so is. * … … after, o’course, hugging One o’m’Sons, Zac, who was that summer and fall in to its December then, a Brooks Lodge employee. Its tourists’ season ends end o’Septembers, but Zachary stayed on till … … only ONE bear, per the last most recent week, ‘ad been sighted .awake. and not yet in to hibernation. Cuz o’the Lodge’s / outbuildings’ protection against their clawing and destruction. Then when only one Zac sighted is when the bosses came in with a float plane and flew him out: early December. Only communication for months then was some sort of radio – telephone; they ‘called’ him once a week on Fridays for a number of sightings’ report ! I was worried, yes; he was only 19. What IF he, alone, had had an appendicitis – attack ?! Or something ?! Quite the experience–for both of you! As a mother I can so relate…only 19…but all’s well that ends well, and I’ll bet this was quite the formative experience for Zac. … … ( trans – ) f o r m a t i v e !